You are currently browsing articles tagged Silchester. It has been a busy first week at the kiln site, we spent the first few days cleaning up the trenches and have now moved onto excavating the key features identified. 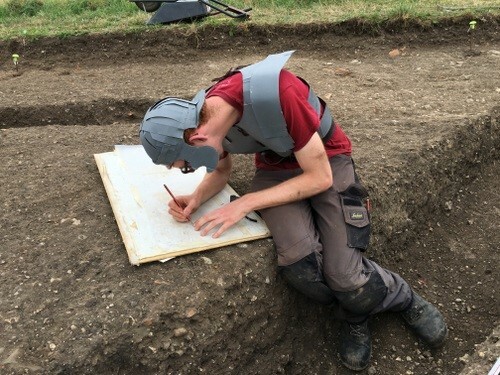 This excavation is being undertaken as part of the Nero & Silchester project, investigating the production of tiles stamped with the title of the Roman emperor Nero (AD. 54-68). Eleven such tiles have been found at several sites within the walls at Roman Silchester, providing tantalizing evidence for imperial involvement in construction at Silchester within 25 years of the initial Roman invasion of AD 43. 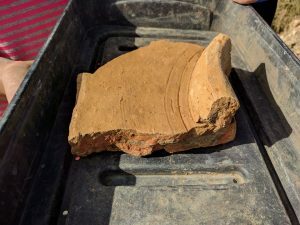 The site was investigated during the 1920s by Lt. Col. Karslake during which he recovered a tile with “a round stamp in the centre with the legend NER. CL. CAE. AVG. GR., of much the same form but not identical with the stamp with the same legend which was discovered in 1903-4 in a deep latrine pit adjacent to the baths at CALLEVA”. In full the legend reads ‘Nero Claudius Caesar Augustus Germanicus’. 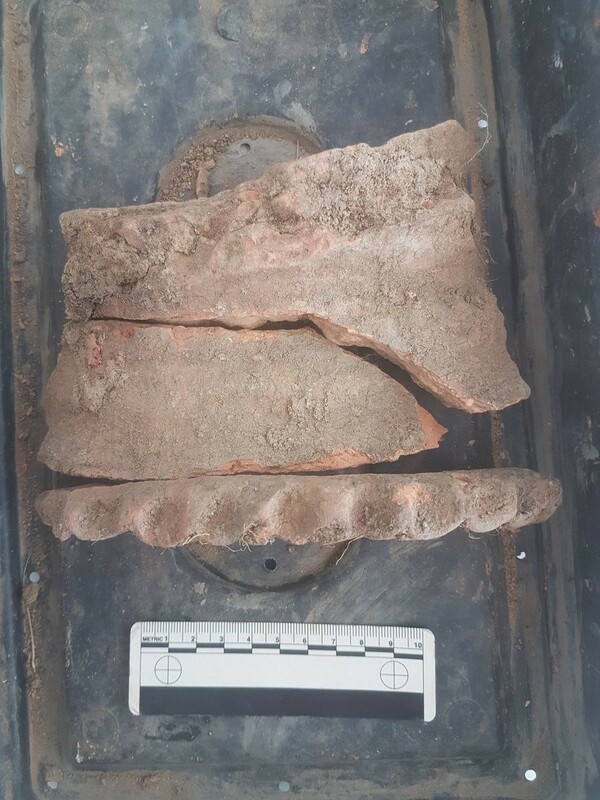 From the first weeks’ excavation has we have recorded nearly 300 kilos of ceramic building material (CBM), which includes a large amount of over-fired and vitrified tile which have been exposed to extreme heat, much of this has been recovered from what appear to be waster dumps. The material also includes a number of particularly exciting pieces. There is one tile, with a stamp to the surface, whilst we cannot identify any letters within the stamp it is of the same size and form as the Nero-stamped tiles, and has been recorded as another example, taking the total to 13. 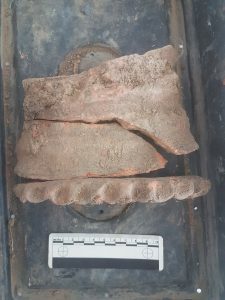 We have also found parts of a ceramic chimney, with elaborate pie-crust decoration and a large amount of relief-patterned tile, which has been keyed using a roller-stamp. The examples recovered so far all feature designs from the diamond-and-lattice group. 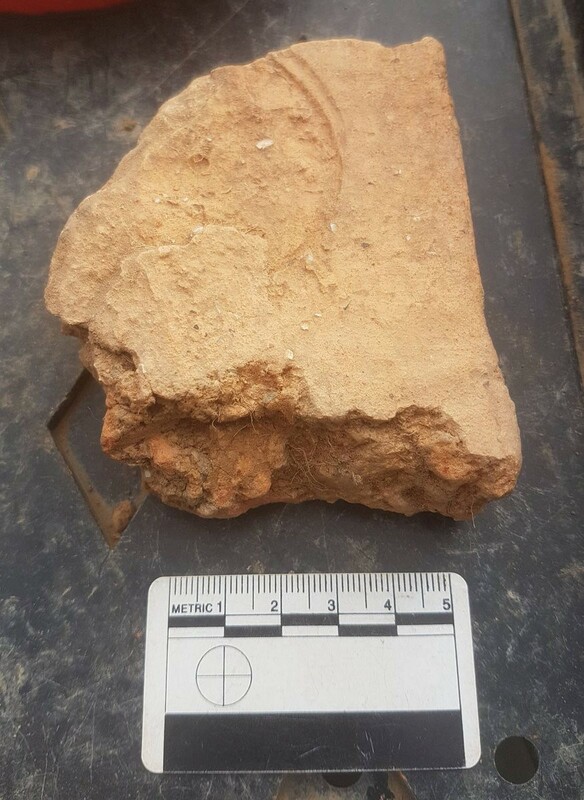 Another interesting tile is in the form of a roof tile, tegula, with a circular hole in the centre. These are thought to have been to provide a vent for smoke or to secure a chimney. 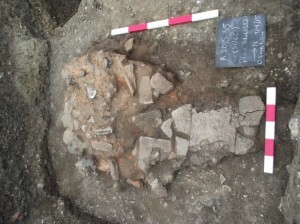 We have only been able to trace references to two other examples from Roman Britain, so this is particularly exciting. With all these interesting pieces include in the material from week one, we are really looking forward to see what week two brings. 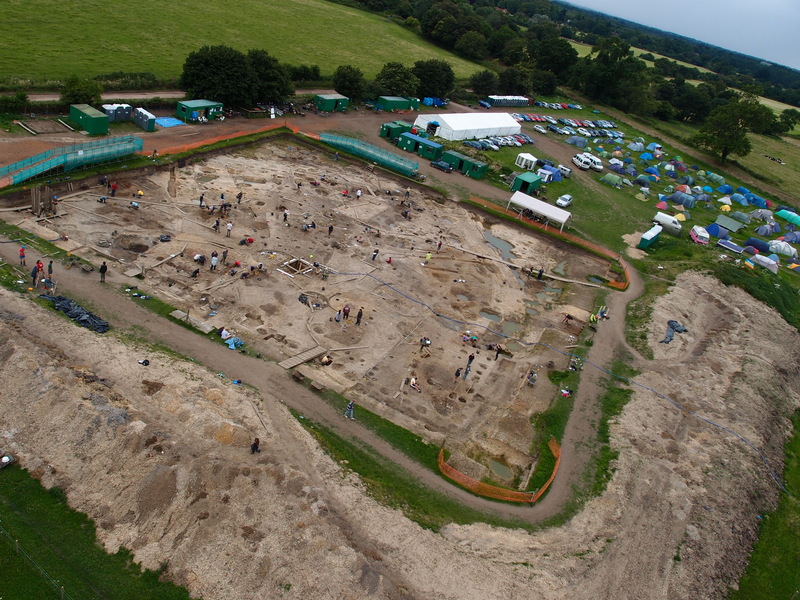 Keep up to date with our daily updates at twitter: @silchexcavation and on our facebook page: Silchester Archaeology. 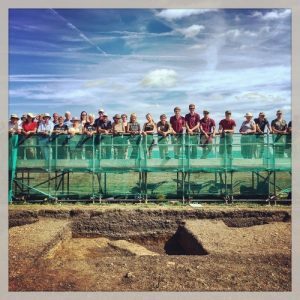 On Wednesday 14th October, Mike Fulford gave a public lecture on the results of the Insula IX ‘Town Life’ Project: 500 years. 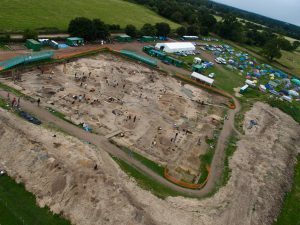 The fieldwork aspect of the 18 year excavation project came to an end in 2014, but a large team are busy undertaking the post-excavation analysis. 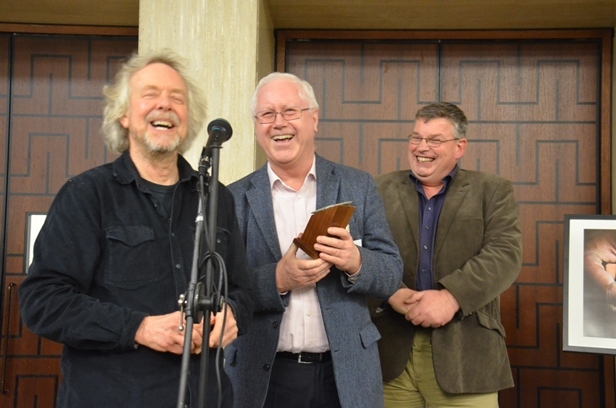 Mike’s last public lecture at Reading was 5 years ago, so there was plenty to talk about – the lecture theatre was fully booked, and the audience was packed with old friends from fieldwork, local residents, staff and students. 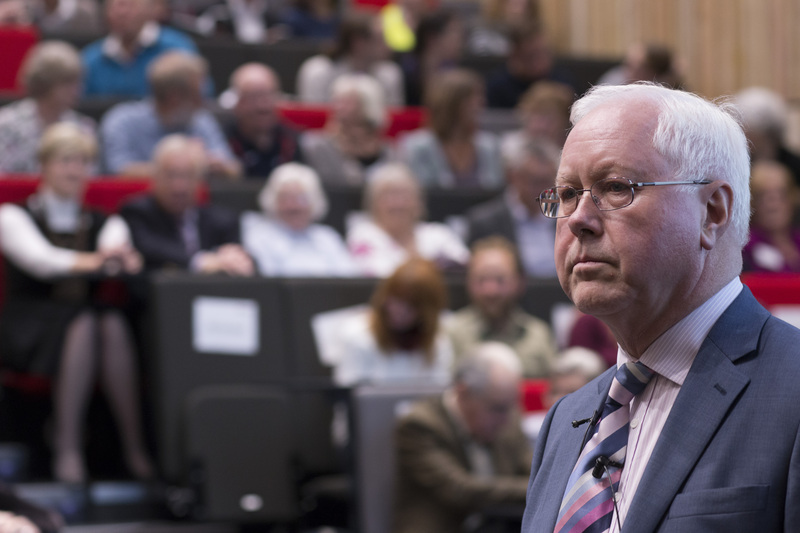 After an introduction from archaeologist and Deputy Vice-Chancellor Prof Stephen Mithen, Mike started off by setting the scene. 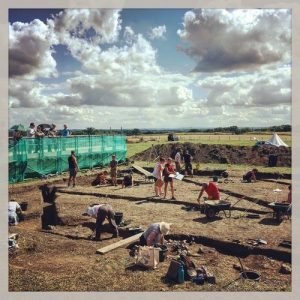 Calleva Atrebatum is one of only three major Roman towns in Britain on a greenfield site, meaning the archaeology is preserved much better than places like London and York. The Society of Antiquaries excavated the site from 1890-1909, but they missed an awful lot of the archaeology and stratigraphy. Insula IX was chosen back in 1997 as there were plenty of gaps on the map (meaning undisturbed archaeology), plus buildings on the ‘Late Iron Age’ alignment. Mike casually offered some impressive stats – Insula IX has produced 62486 finds and 16240 contexts! Based on all of this information, the current chronological outline of Insula IX was presented. 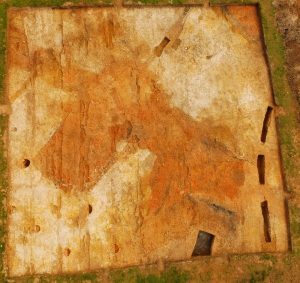 The Late Iron Age phase of occupation is currently dated from c. 20 BC to AD43, consisting of a ‘Great Hall’, a series of trackways, pits and wells. After the Roman conquest in AD43, activity within the Insula became much more intensive, but still clinging on the northwest-southeast alignment. At the end of the first century AD, there was a major reorganisation of buildings within the Insula, and again in the late Roman period. Faced with the wealth of material and environmental evidence for life in Insula IX, Mike highlighted a few key themes. Firstly, the wealth of Silchester was shown through objects such as Harpocrates, the Silchester eagle and imported glassware. Secondly, dogs! 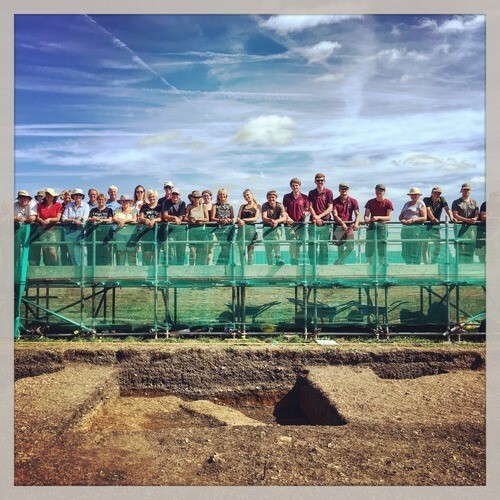 From the Late Iron Age lap dog buried in the foundation trench of the Great Hall, to the dogs buried in a later Roman pit along with a raven and the famous mating dogs knife handle, and the evidence for dog skinning in the mid Roman period, dogs were a theme of the excavations. Thirdly, the living conditions within Insula IX were a key point, with trickling filter fly, whipworm and maggots all found through the environmental analysis of wells and cesspits. 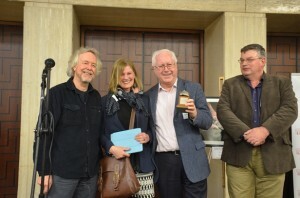 Along the way, Mike highlighted the work of researchers in the Department of Archaeology, including Rowena Banerjea’s study of floors and buildings through soil micromorphology, John Allen’s work on building stone, and Lisa Lodwick’s research on early food imports. 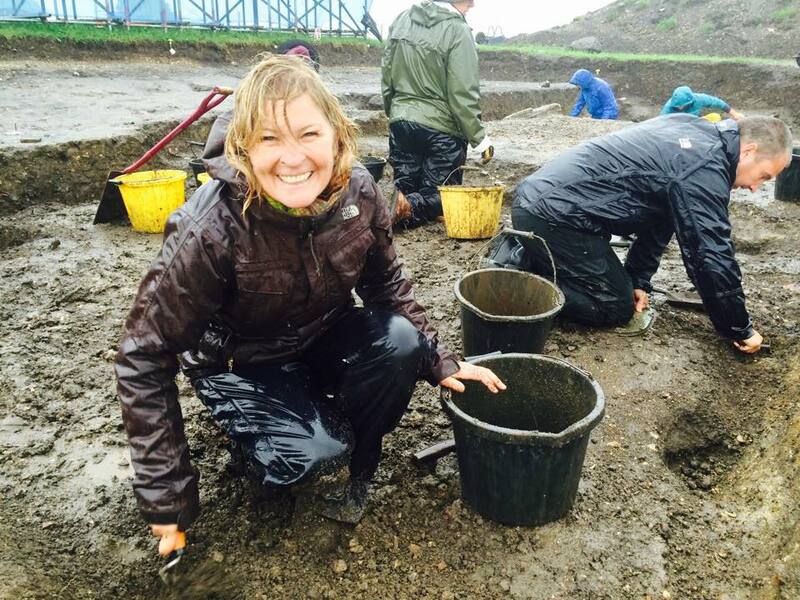 Plus of course the amazing archaeological work of Amanda Clarke and her team of excavators! The lecture was accompanied by a display of artwork from the Silchester artist in residence Jenny Halstead. 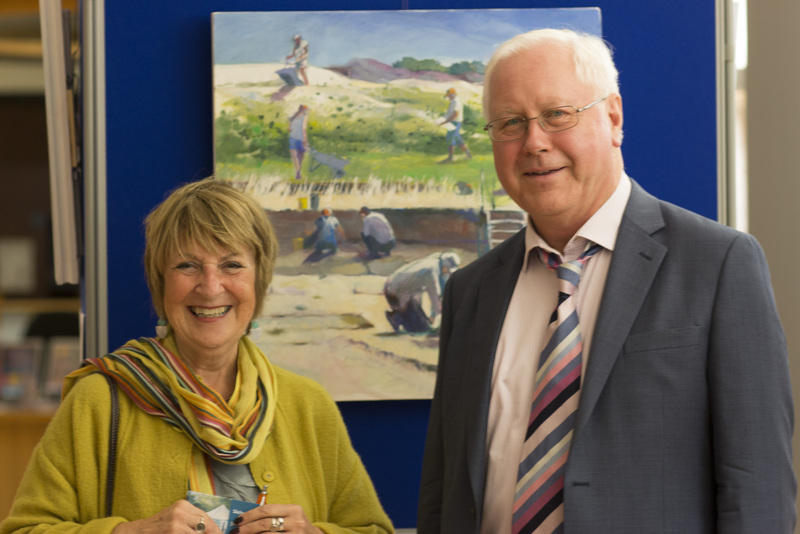 Jenny’s paintings and sketches will be on display at the Old Fire Station Gallery, Henley-on-Thames from Saturday 24th October – Tuesday 3rd November. 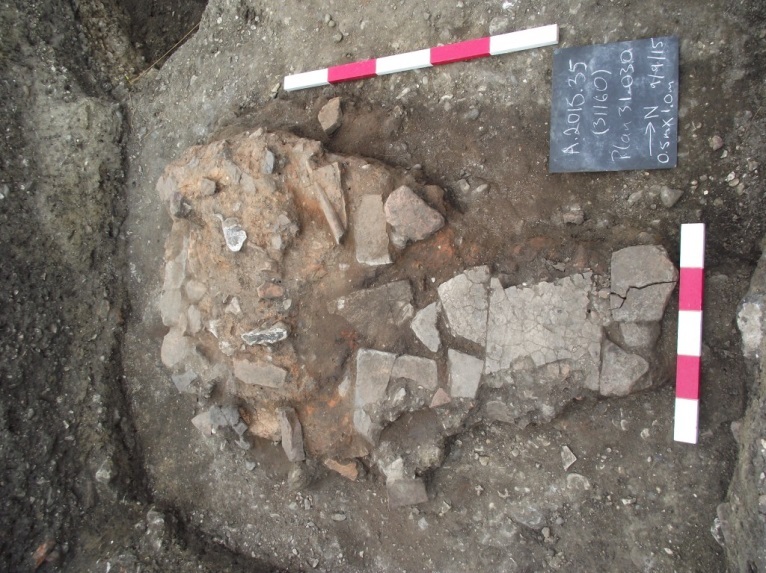 Looking forward, work is steaming ahead on preparing the next Insula IX monograph on the Late Iron Age archaeology. 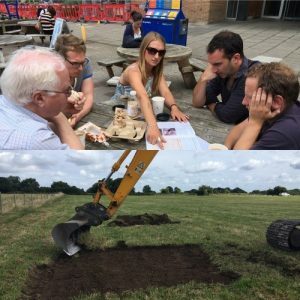 Meanwhile, the exciting new Iron Age environs project is using a range of techniques, from LIDAR to geophysics, to investigate Iron Age activity in the wider area – something which will provide a vital prologue to the Insula IX story.